So lately, instead of throwing the empty tins away, I've come up with ways in which I can turn them into toys for Myla Rae. It doesn't take much effort, yet it gives her hours, days, even weeks of fun with each project I make. Wrap the tins with pretty wrapping paper and some felt or cloth. Decorate with strings to help LO grip onto the Bongo and do include some beads for added sensory and tactile play. Let your toddler have a great time banging away. Try using different sized tins to make a combination of different sized bongos! I got this idea from going to an indoor playground where there is a climbing section for toddlers. 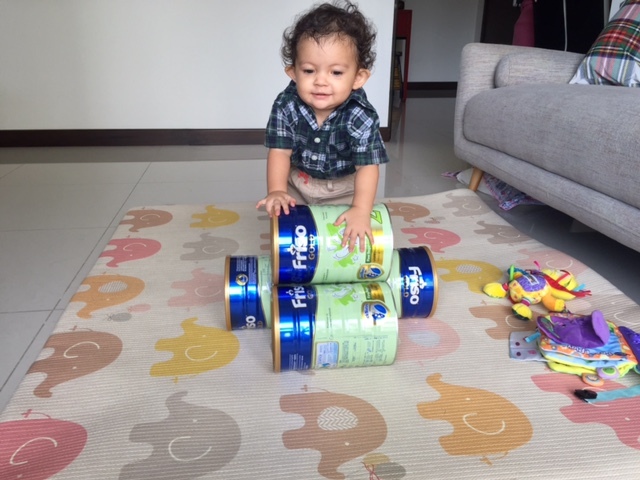 So I came home and used our empty formula tins to create a mini climbing obstacle for Myla Rae. Stack 3 or more large tins together and fasten them with tape and epoxy glue (make sure you fasten them properly and won't come loose, making the structure dangerous). 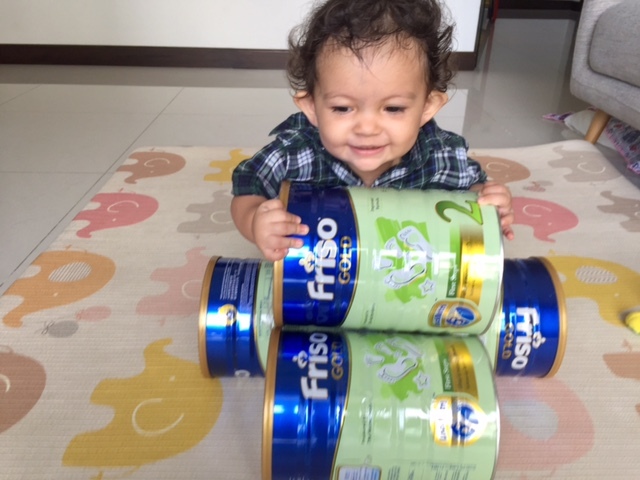 I used 2 x empty 1.8Kg Friso Gold tins. Fill the tins with something heavy like sand. You can even fill some with bells or beads which will make sounds when moved around. When stacking, you can use your creativity... the object is to make them like steps. The more empty tins you have, the more elaborate your creation can be! I shall add on to this in the coming months because she enjoys it so much. Always supervise your toddler's play time, and of course don't go nuts and create an obstacle course that is too high and dangerous! Cut slots into the plastic lid and with some huge plastic coins it will become a piggy bank where baby can practice fine motor skills. Friso tins come with an additional metal lid to lock in freshness, I discarded that as it's not safe to cut into that. Just using the soft plastic lid will do. To learn more about how you can give your child more fun play experiences as they grow, check out these articles and resources from Friso. 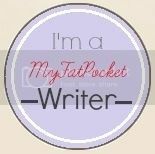 There's so much you can do. Have fun!